Like most selling artisans, I started with a couple of product lines and have gradually added to them over time. But I'm at a point now where simply adding new variations to the same themes is feeling stale. But I'm working full-time and it's been a long, meager winter so how to put some shine on my product offerings this Spring? First, I'm going back to basics, simplifying, and broadening. These things seem contradictory, and I suppose intrinsically they are but.... I'll explain. 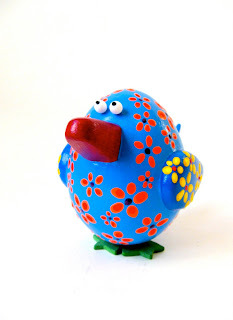 My very first product line --- what I launched my Etsy shop with --- was paper-mache bird figurines painted in crazy colors with flowers all over them. Very cute, but very labor intensive and not really sustainable as a core product as such. The legs in particular took forever to get right. The color schemes were also a bit unduly complicated. So, over time I simplified their design. 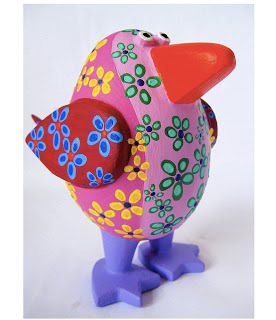 For Spring, I'm further simplifying my bird design and also broadening my paper-mache-sculpture line to include piggy banks. I did a birdie-bank once, but the fact that it was a bank was lost on most potential buyers, and the person who eventually bought it didn't even care about that feature. So, OK go with pig-shaped banks. It's what people expect banks to look like, it's an easier shape to make, and it widens the children's-gift market to me considerably. And as far as time and money, go, it's do-able. I just need to fine-tune the mechanism for releasing the collected coins.... (to be continued).